Shane Howard is a prolific Australian songwriter, admired and respected for his integrity and commitment to music. His songs champion the cause of the common man, the environment and the injustices endured by Australia’s Aboriginal people. After 30 years of singing, writing and journeying the globe, from campfires to concert halls, he has consolidated his voice to become an important addition to the evolving folklore of modern song. Howard’s 13th solo album Deeper South redefines the boundaries of Australian folk music and reinvigorates it with poetic and musical mastery. 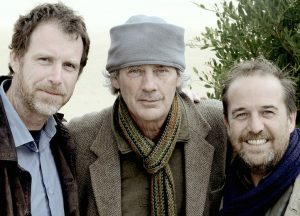 The Shane Howard Trio features the mastery of Howard’s musical companions Ewen Baker (Fiddle. Mandolin) and John Hudson (Guitar, Dobro). The Deeper South show features songs full of music and poetry that are deep and dark, yet illuminated by great shafts of light. This is folk music, but not as we know it.